and snowshoe hares have also been known to consume the leaves to some extent. Fall. Though not a major wildlife food, the translucent red berries are eaten by ruffed grouse, Eastern chipmunks, and white-footed mice. Lore: The bittersweet berries, although not poisonous, are not very palatable. Rose family. Shrub or small tree in cool, moist woods openings. Its alternate compound leaves with eleven to seventeen leaflets, gummy red buds, flattish sprays of white flowers, and fleshy, orange-red fruits identify the American mountain ash. The northern or showy mountain-ash (S. decora) is more common northward, while the European mountain-ash (S. aucuparia) is the prevalent ornamental species. Other name: Rowan tree (S. aucuparia). Close relatives: Apple (Pyrus malus); hawthorns (Crataegus); cherries (Prunus); shadbushes (Amelanchier); roses (Rosa); blackberry and raspberries (Rubus); unrelated to white ash or Northern prickly-ash. Lifestyle: Mountain-ash rivals flowering dogwood as one of the most beautiful flowering forest trees in spring. It grows in acid habitatsconiferous and northern hardwood forests, bogs, rocky hillsides. Unlike the dogwood, it is mainly a short-lived edge species rather than a forest understory resident, though it is moderately shade tolerant and slow growing. The small bisexual flowers in flat-topped clusters are insect pollinated. They develop into small, berrylike pomes (like apples) that often remain over winter. Not a cloning plant, mountain-ash typically grows solitarily and scattered among other northern edge and wetland species. It occasionally hybridizes with chokeberry (Aronia). Associates: In its upland habitats, mountain-ash may associate with balsam fir, white spruce, yellow birch, and maples. It also favors plum thickets (Prunus). Spring, summer. Leaves and flowers that suddenly wilt and appear scorched as if by heat may be infected by fire blight (Erwinia amylovora), a bacterial disease that also produces cracked, scaly cankers on twigs and branches, sometimes girdling the trunk and killing the tree. Mountain-ash shares with apple and hawthorns many foliage, fruit, and wood insect foragers (see Hawthorns). Skeletonized leaves, especially on upper portions of the tree, may indicate mass feeding of mountain-ash sawflies (Pristiphora geniculata), black-dotted green larvae resembling moth caterpillars. Yellow-bellied sapsuckers often drill into the bark (see White Birch). Fall, winter. A common fruit-boring caterpillar is the apple fruit moth (Argyresthia conjugella). Though the pomes, with their low fat content, are not prime wildlife foods, their winter availability often attracts ruffed and sharp-tailed grouse, yellow-bellied flycatchers, cedar waxwings, thrushes, and evening and pine grosbeaks. Fermented fruit can occasionally give feeding birds a "buzz." Moose relish foliage and twigs of mountain-ash. Lore: The fragrant inner bark has astringent and antiseptic properties but was apparently little used by Native Americans. They did use the fruits, rich in ascorbic acid, as a tea for preventing or curing scurvy and as a rectal wash for hemorrhoids (the number of native remedies for this condition reveal it as a common ailment even in less stressful times). The fruit (high in pectin) makes good jelly but is best picked when dead ripe, after repeated freezings have cut its bitter astringency. Mulberry family. Tree in rich woods, bottomlands, edges. Its shiny, heart-shaped, sandpaper-textured leaves that are often lobed, milky sap, red-brown trunk, and blackberrylike fruits identify this tree. The similar white mulberry (M. alba), an introduced species, has whitish fruits. Close relatives: Osage orange (Maclurapomifera); hops (Humulus); hemp (Cannabis sativa); fig (Ficus carica); breadfruit (Artocarpus communis) ; rubber tree (Hevea brasiliensis) . Lifestyle: Botanically the mulberry family stands between the elms and the nettles (Urticaceae), showing certain similarities to each. Lobed leaves are typical on young trees and sprout shoots. Unlobed leaves, which suggest those of American basswood, occur mainly in the tree crown. The somewhat flaky bark resembles hop hornbeam. 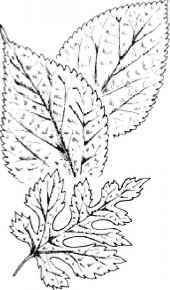 Variations in leaf shape characterize mulberry foliage. Many different lobed and unlobed forms are often found on the same tree, but lobed leaves seem predominant on younger trees. drupes. But whereas the blackberry cluster is an aggregate fruit developing from a single flower, the mulberry cluster is a product of many flowers on a single catkin. In other words, each drupe in the cluster develops from a single flower. This moderately shade-tolerant tree reproduces easily and quickly from seed and from cuttings. Though usually a small, short-trunked tree, red mulberry may reach eighty feet tall in optimal habitat. The tree is mainly southern in distribution, extending only to southern New England, Ontario, and South Dakota. Associates: Mulberry usually grows scattered among other deciduous bottomland or moist woodland trees including American elm, Northern hackberry, and tulip tree. In edge habitats, I often find it growing in association with box elder. Summer. Jet-black, white-fringed, oval larvae of the mulberry whitefly (Tetraleurodes mori), a sucking bug, mass on leaves. The waxy-winged adults, resembling tiny white moths, fly out in clouds if leaves are disturbed. Dead branches and cambium mines on the trunk may indicate the mulberry borer (Dorcaschema wildii), a longhorned beetle larva, severely destructive to mulberries in the South. Seeds are primarily dispersed by birds and mammals. The highly nutritious fruits, even before fully ripened, attract many birds. Frequent feeders include red-headed and red-bellied woodpeckers, American crows, wood thrushes, gray catbirds, Northern mockingbirds, brown thrashers, cedar waxwings, European starlings, Northern cardinals, and Northern and orchard orioles. Gorging birds sometimes become intoxicated on overripe fruits. Gray and fox squirrels are the top mammal consumers. I have also observed woodchucks feeding on the fruits of low branches. All year. Clusters of dead and living twigs near branch ends ("witches' brooms") result from repeated twig dieback caused by the coral spot canker fungus (Nectria cinnabarina). 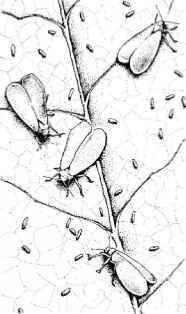 Whiteflies, common feeders on mulberry leaves, are actually sucking bugs that resemble small whitewinged moths. Tiny larval whiteflies surround the adult insects in this hand-lens view. Look for the coral spot cankers at bases of dead mulberry buds and twigs. Lore: Farmers' wisdom advises that frost danger is past when mulberry leaves appear. The wind gives these leaves sounds of crowd activity. The Old Testament records God's instructions to King David to use these mulberry sounds as camouflage for an attack. High hopes for an American silkworm industry, using the imported M. alba and M. multicaulis, collapsed in 1840 with high labor costs and failure of the mulberry plantations. Sweet red mulberries have never achieved wide popularity in the American diet, mainly because they are easily damaged during shipment (though they freeze well). Unripe fruit, containing hallucinogens (as do the bark and raw shoots), should not be eaten; nervous agitation and extreme digestive upset can result. The new leafless shoots make a good cooked vegetable when boiled. Native Americans used a shredded root and bark decoction as a laxative, and the milky latex from the leaves was a scalp treatment for ringworm. In urban areas, mulberry is frequently considered a nuisance; its abundant fruit litters and stains sidewalks, cars, and shoe soles. People who wish to attract summer birds to their yards, however, can do no better than to plant a (female) mulberry tree. Nightshade family. Low, vinelike shrub in moist thickets, edges. Five violet (sometimes white) reflexed petals with a yellow, beaklike center, leaves with (usually) two small lobes at the base, and drooping clusters of bright red berries identify this plant. The black or common nightshade (S. nigrum) has a similar flower that is white, and it produces black berries. Other names: Bittersweet, bitter nightshade, blue bindweed, climbing nightshade, poisonflower, woody nightshade. Close relatives: Potato (S. tuberosum); eggplant (S. melongena); tomato (Lycopersicon esculentum); jimson weed (Datura stramonium); tobacco (Nicotiana tabacum) ; petunias (Petunia) ; not related to enchanter's nightshades (Circaea). Lifestyle: Shade-tolerant nightshade, though viny, doesn't really climb; it has no tendrils or pronounced twining habit. Instead, it loops and sprawls across convenient supports, mostly other plants. doesn't need elaborate schemes in order to reproduce. Flowers are probably as often self-pollinated as insect pollinated, and they appear continuously from spring through early fall. 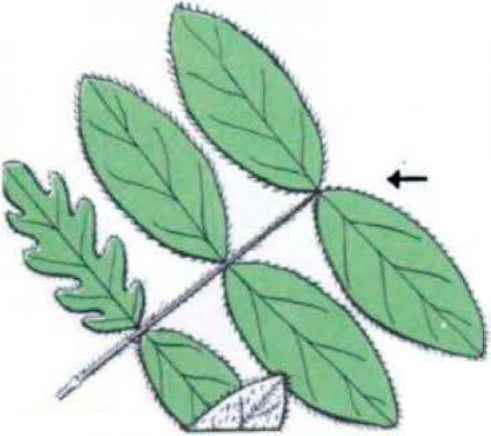 Leaves vary somewhat in shape; they may or may not show basal lobes. Fruits often remain on the plant from summer through the following spring. Associates: Spring, summer. Flowers are pollinated mainly by honeybees (Apis mellifera) and pollen-feeding beelike flies. Many of the foliage-feeding insects that feed upon potato are common on nightshade. The three-lined potato beetle (Lema trilineata) is reddish yellow with black stripes. The Colorado potato beetle (Leptinotarsa decemlineata), yellow with ten longitudinal lines on the back, lays bright, orange-yellow eggs on leaf undersides; look for the red, humpbacked larvae. The potato flea beetle (Epitrix cucumeris), tiny and black, appears in masses and riddles leaves. The four-lined plant bug (see Currants and Gooseberries) is another common feeder. Summer, fall, winter. At least thirty-one bird species are known to consume the berries, and twelve mammal species eat the fruit or leaves. Wood ducks, ruffed grouse, ring-necked pheasants, and wild turkeys are among the game-bird feeders, and many songbirds also eat the berries. The seeds are mainly dispersed via bird droppings. Striped skunks also devour the fruits, and cottontail rabbits browse on the stems. Lore: Just how poisonous the red fruits of this species are to humans is undetermined. 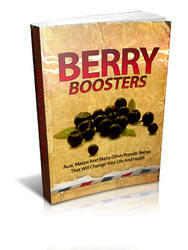 Recent consensus is that ripe berries are bitter and unpalatable, but not highly toxic. It took Thomas Jefferson to convince us that the closely related tomato wasn't a deadly fruit. Still, few (including this author) have ever tested their theories by eating nightshade berries. Livestock are sometimes poisoned by eating the foliage. The toxic compound is solanine, an alkaloid. A popular folk remedy for rheumatism used a daily infusion of the dried plant, which presumably was harmless in that condition. Pliny recommended the juice as ''good for those that have fallen from high places" (a nudge toward suicide? ), and medieval folk ascribed magical and witch-proofing attributes to the plant. Native Americans, of course, weren't familiar with it, since it didn't appear on these shores until European settlement. This plant is the true bittersweet (so named from the berry taste), a label mistakenly attached in this country to an unrelated climbing vine (see American Bittersweet). (Q. coccinea), Northern pin oak (Q. ellipsoides), and black oak (Q. velutina). Other name: Northern red oak. Close relatives: White oaks (Quercus); American chestnut (Castanea dentata); American beech (Fagus grandifolia). Lifestyle: Any oak with pointed, bristle-tipped leaf lobes belongs to the red oak group, sharing most of the biological characters (and associates) of Quercus rubra. All oaks of this group produce acorns that require two years to mature. Wind-pollinated flowers appear in late spring when the leaves are half-grown, the male flowers in slender, dangling catkins, the greenish female flowers solitary and inconspicuous. The catkins often veil the crown portion; the pistillate blooms occur lower on the same tree. Members of the red oak group often hybridize, producing trees with variably shaped leaves and acorns, which defy easy identification. Red oak is the fastest growing of all oaks and, in optimal habitats, is among the largest and longest lived (two hundred to three hundred years). The tree's profile generally reflects the light conditions in which it grew, regardless of the present site density. (This is true of most trees, but the profile differences are especially pronounced in oaks.) If it grew in the open, the tree has a short, thick trunk and wide-spreading crown; forest-grown trees, on the other hand, stand straight and tall with narrow crowns. A deeply set, lateral root system firmly anchors the tree. The red oak thrives better than most other oaks in cold climates, but it is also more vulnerable to drought. Its common name describes the autumn foliage color, often deep wine-red or orange; twigs and inner bark (and sometimes leaf midribs) are also reddish. Leaves, extremely variable in shape even on the same tree, may remain attached into winter. A dry oak leaf may consist of up to sixty percent tannins. This tree sprouts vigorously from stumps and roots, providing fairly quick natural reforestation of timbered or fire-ravaged lands. Associates: Mature red oaks are generally codominant in climax deciduous forests with hickories and other oaks. The tree also occurs in mixed stands with sugar maple, American beech, American basswood, white ash, tulip tree, black cherry, and pines, among others. Spring, summer. The most destructive disease of red oak is probably oak wilt, caused by the fungus Ceratocystis fagacearum. It is marked by fast-dying foliage, often resulting in complete defoliation and death of the tree. Spread of this disease often occurs via the natural subsurface grafting of roots. Sap or picnic beetles (Glischrochilus), feeding on bark wounds, also spread the disease. The common insect foragers of oaks number at least one thousand species. We'll look at a few of the most notable.